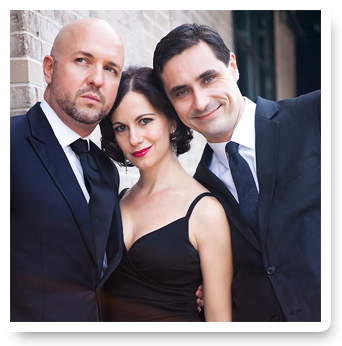 In 2012, soprano Erin Shields, baritone Giuseppe Spoletini, and versatile and virtuosic David Shenton (violin and piano, sometimes simultaneously) met in New York City. The three formed their uniquely talented crossover ensemble and have indulged in their love of music, performance, and teaching at venues across the country ever since. "O Sole Trio's show Bravissimo Broadway combines classic show tunes from the most beloved Broadway musicals with their own breathtaking and unique arrangements. The performance includes highlights from shows such as Les Misérables, West Side Story, and Phantom of the Opera, mixed with outstanding original arrangements, such as the hauntingly beautiful Edelweiss from The Sound of Music, in three-part harmony, and a gorgeous ‘mash-up’ of Ghost: the Musical’s ‘With You’ with Ghost: the Movie’s ‘Unchained Melody’. The show will take you on a thrilling 70+ year adventure of the best songs and behind-the-scenes stories Broadway musicals have to offer." O Sole Trio will also be conducting an outreach for area students at Sandusky High School on the morning of October 17. For more about O Sole Trio, visit their web site. Tickets for this concert are $18 for adults, and $8 each for students up to age 18, available at the door.